I haven’t blogged since October 31st. That means I might have been a little busy. Like a Risk Management Conference in Madison on the first two days in November. This means that I was able to fill my bag with goodies from the vendor booths, like pads of paper and post-it notes, pens, chip clips, squeezie penguins, more pens, tote bags, highlighters, little plastic calendars, and leftover Halloween treats. Scratch that last one. Being on a part-Keto, part-Paleo, part-Mediterranean eating plan means I can’t have mini Snickers or KitKats or anything with dairy, gluten, high carbs and sugar. Sounds awful, but it means that I’ve lost a few pounds and feel good. Being at the two-day conference also means that I learned a few things about ergonomics and dog safety and stuff related to risk management. And I was able to watch the beautiful sunrise last Friday morning, from the window of my hotel room. I usually write posts for the week during the weekend, but it didn’t happen last weekend. Anyhow, I was cooking and shopping and studying last Saturday and Sunday. Studying for an important appointment on Wednesday morning, which meant that I couldn’t spend time writing my usual fluff for One-Liner Wednesday. There will be more on the topic of important appointment at a later date. The studying continued Monday and Tuesday after busy catch-up days at work, which means someone didn’t get all the lovin’ he wanted. He was staring me down with a pet-me beg. Or he was saying, “Really? You can ignore my cuteness? You’re such a B…” in his little kitty head. Sorry Gibbster, your mom means well, but she’s got priorities. Wednesday arrived, studying was done, appointment was done by 9 am. I took the rest of the day off. Which means I could do whatever I want. Which means I rewarded myself with a black bean brownie from Happy Bellies, a gluten-free bakery which also offers dairy-free, egg-free, grain-free, nut-free and low glycemic options. I can have treats there! I suppose I could have spent part of my Wednesday writing a post, but I chose to eat up the day with more food prep, doing laundry, buying a lamp to replace the one that died, buying two sweaters at Kohl’s, and a black bean brownie. There are days that I think I can write a post during my lunch time. It never happens. By the time I make lunch, eat lunch, and scroll through the Facebook and Instagram likes and photos and memes, 45 minutes have passed and that means I have to get back to looking busy for the boss. I didn’t have anything planned for Thursday night until I got the email. The one from the library that said my book was in. I’ve been waiting for this book to be available for many weeks. It’s a popular book, one that came out in August. It’s so popular, in fact, that the library only lets people check it out for two weeks. There’s still a waiting list, so that means I have to spend some quality time with the crawdads and the characters. Less time with my blogging buddies. I hope you understand and forgive. I’ve been feeling very guilty of late for getting around to blog posts late or not at all. Something always uses up my spare time. It’s almost 6 pm on Friday night as I type this, so it means I need to end this crazy post and make supper. Squash, rice and an organic, nitrate-free, grass-fed beef hot dog. Not quite as good as the black bean brownie, but it’s filling and nourishment for the 6:15 am Saturday morning workout with a trainer. Yeah, I said 6:15 am, and I mean it. Winter showed up early Friday morning. A little bit of the white stuff. It turned cold too. I don’t know if it means we’re in for a long winter or if we’re getting it out of our system early. I’d like to believe the latter. 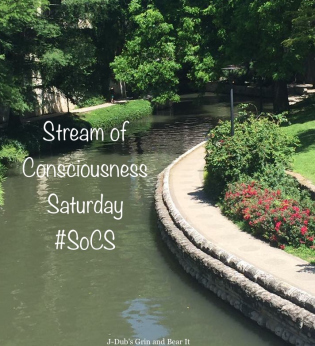 Stream of Consciousness Saturday is the brainchild of author Linda G. Hill. Every Friday, Linda provides her followers with an inspiring blogger’s prompt. It can be a word or words and sometimes bonus points are involved (my favorite). Linda asks us to write without editing, other than correcting spelling errors. Like a babbling brook, ambling stream or running river. Click HERE if this type of writing floats your boat or helps with your decision-making. I’ll give you 100 bonus points for the week/weekend deal, 100 more for eating healthy and 300 more for remaining optimistic! Gibbs wants me to consider revoking most of them. I told him to take a nap and reconsider. I love that beautiful sunrise. It’s always a surprise when your hotel is facing the right direction. I’m glad the busy week is behind you. Dig into your book and enjoy the weekend. All the blogs will be here and all the bloggers care enough to wait. Gibbs took you up on that advice. He’s napping and has forgotten all about subtracting bonus points. The fact that I posted yet another photo of him may have also helped the cause. I’ll be reading to my heart’s content as soon as I read a few blogs, make spaghetti sauce and eat my post workout breakfast. Oh, and there may be one too many cups of coffee today because it’s that kind of day. Ha! Gibbs’s sweetness hides his naughtiness! He really is a good boy, I’m glad he’s such a social creature and not hiding under the bed. Your photo of the sunrise is pretty. 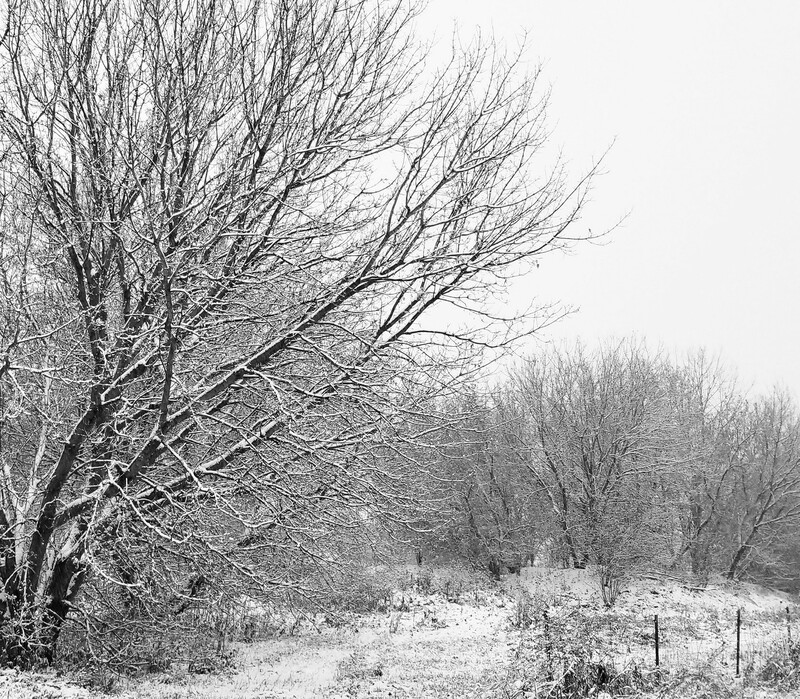 Those colors are lovely, although in fairness I like a pretty black and white snow pic, too. Your time away from the blogosphere sounds like it was well spent. Glad to see you back, though. Thanks, Cheryl, I’ll take it! Yes, dear Mary, you’ve been busy – enjoy the weekend reading! I’m guessing the kitties will enjoy you sitting still so they can join you! I will enjoy Shelley. Most likely, there will be two furry couch potatoes joining me when the time comes. Have a wonderful Saturday and stay warm! I don’t think I’ve ever had a black bean brownie. Gonna look for one. Or make one! Hmmm. Have a great weekend! There are plenty of recipes online for black bean brownies. I guess you will have to try a few to see which one you like best. I mean, one has to perform quality assurance in these instances. Yw – love your blog! Thanks Paula. Gibbs the cat also thanks you. 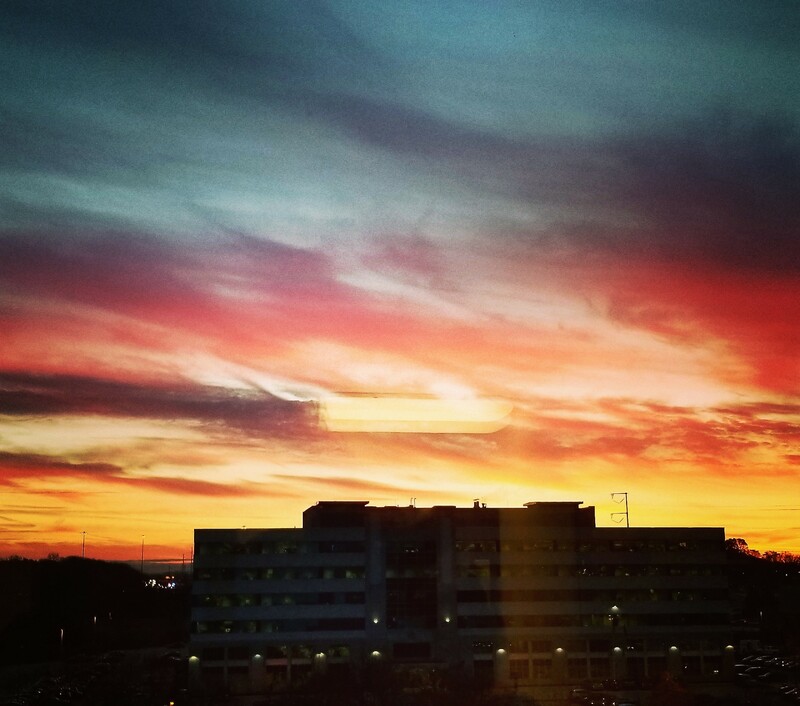 I adore colorful sunrises and sunsets, but can’t always capture their beauty. I’m glad I was able to capture this one successfully. Cats are so wonderful. Gatsby is my sweet baby, even though he’s technically an older dude himself. I’m also GF, DF, EF, SF, so that brownie sounds good! I hope things settle down soon. Sometimes BUSY takes up all the space and all you can do is wait for the settling down. Glad to see you coming out the other side! Keep on keeping on … and happy weekend!! Thanks Joanne! Brownies make everything right…along with adult refreshment and a Saturday to relax. 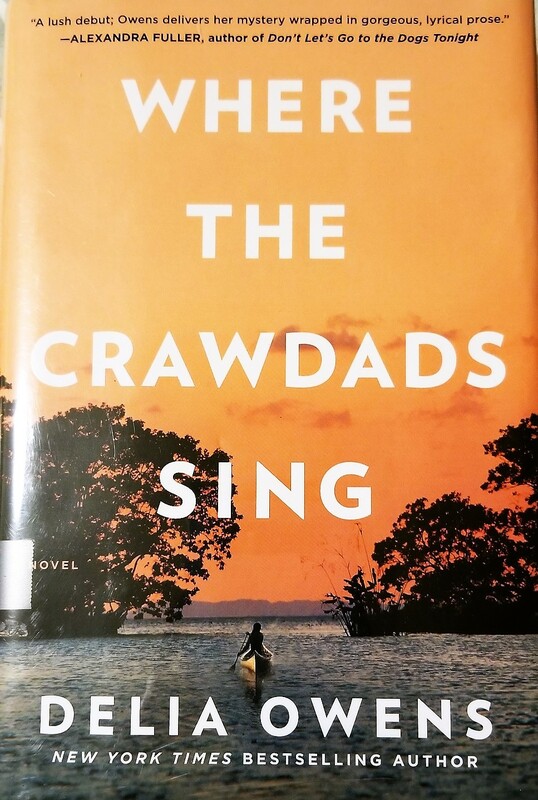 I’m going to add “Where the Crawdads Sing” to my TBR queue. Always on the hunt for the next big read. This is a book that’s hard to put down. I’m 3/4 of the way through and I can say it’s a must read. I am 16th in line for 3 copies. I might be reading it come January. tick tock. Can’t wait! Hello Cobs! Hope all is well in your neck of the woods. Gibbs is not a grab and pretend bite kind of guy. He’s rather shameless in enjoying a good bella rub. For my girl…well, she sets a trap with her adorable tummy and you’d better beware. She does not like tummy touching and is not afraid to act upon it. Makes me crazy because she’s so darn cute. Hugs and squidges back at you, my dear! Alf Capone (big Puma like baby), invites people to tickle his tummy …. and I warn EVERYONE not to do it. “Don’t be taken in!” I say. But … there is one person, who shall remain nameless, we’ll just call him Son-in-law, thinks that he knows better. Alf Capone got him big time on Saturday, and I just sat here and smiled. I’d warned him and warned him but, (sigh) … maybe it’s because he’s a MAN and I is jus’ a woman, but he thinks he knows my cat better than I do. HA! (serves him right). I love Gibbs soooo much. 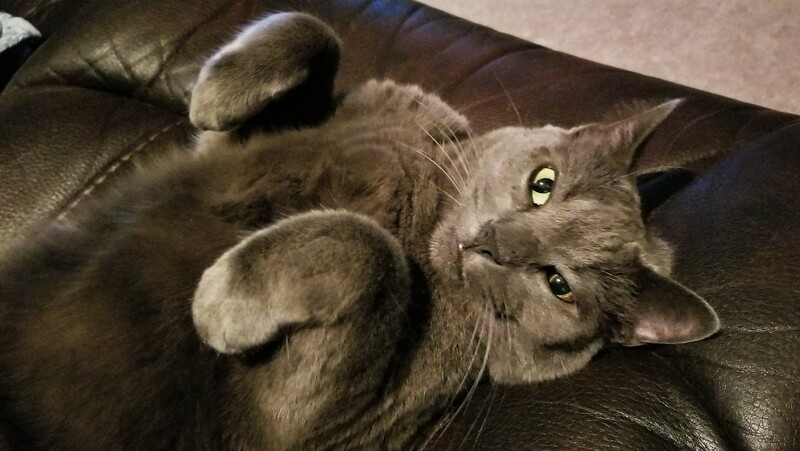 He’s such a kissable pusscat. Cheers to the suitably named Alf Capone, who uses his claws admirably to defend the Mama. Sometimes less is more. I went through a blogging meltdown a month or so ago. Now I wait until I have something real to talk about, not just blah blah off the top of my head. And thank you or the book recommendation! I think I might try and find it at my own library. It really is a good book, Claudia. The reviews are correct…I wanted the story telling to continue! Sometimes we just get busy. You got yourself a whole lotta busy all at once. I can tell when I’ve been too busy in many ways, but none of them pains me like pets desperate for affection. Mmmhm. Poor babies. I’m wishing you good balance in the coming weeks. I’m out and about again and poor fur babies are home without love until mom gets home from her busy-ness. Poor babies. Bless. My dog has been beside me every moment of this day. I’ll feel sad to leave her for a bit. Tomorrow will be a better day for us all.